Those who have heard this tremendous player on previous visits will have already pencilled at least one of these dates in. 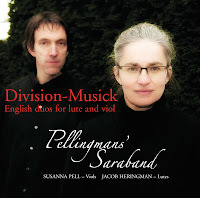 Those who are unfamiliar with his work might like to hear a couple of duo tracks with Paul Edis. Follow the links - it's worth it! Andy Bowen, Andy Wood (gtrs); Fenner Curtis (vln); Steve Laming (bs); Jo Silver (vcl). The burning question is why? Why are there so many Hot Club style bands dotted, not just around the UK but in fact, around the world? At a guess, there's probably more Gypsy Swing groups than there are Glenn Miller ones. Well, they do say that imitation is the sincerest form of flattery so it says much for the originals that just about every city in this country - let alone France and Belgium - has one or more such group. Which of course is great as the originators are long gone but of course the recorded legacy remains. Simon Woolf Sextet @ Pizza Express, Dean St., London. Simon Woolf (bs); Gareth Lockrane (flutes/picc); Henry Armburg-Jennings (tpt/flug); Mark Crooks (clt/bs clt); Colin Oxley (gtr); Matt Home (dms). Two visits to Pizza in three days - I'll be looking like a Pepperoni soon! But, with the collapse of the gig at Ronnie's (from my point of view) it worked out fine. Simon Woolf has opted for a line-up from which you expect nothing less than perfect and that's what we got. 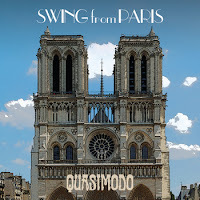 Arrangements by Simon ensured a tightly knit front-line that was, at times, reminiscent of '50s west coast jazz whilst at others it brought to mind earlier groups such as the Johnny Kirby Sextet or some of Raymond Scott's pieces - albeit scored in a contemporary manner. 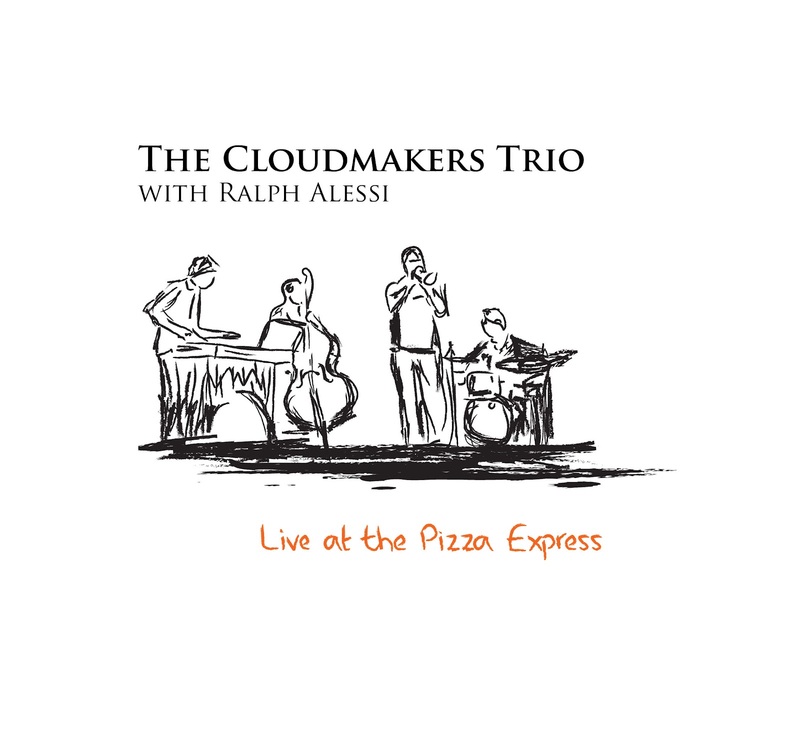 Vasilis Xenopoulos (wonderful Greek tenor saxophonist now based in London) with Paul Edis Trio and featuring the leader's thoughtful, Bill Evans inspired, piano plus the mercurial Mick Shoulder on bass and a great young drummer, Adam Sinclair. Vas is a sensational player, a 50s/60s style warm toned tenor sax player with innate lyricism, a gorgeous sound, exciting, inventive - need I say more. Natalie Williams (vcl); Phil Peskett (pno); Robin Mullarkey (bs). Cadogan Hall is one of the nicest concert halls and, even the smaller Culford Room was an impressive setting with its pillars and celtic knotted ceiling. It made for an intimate, yet very well attended lunchtime gig. This was the first time I'd heard Ms Williams and I have to say I wasn't disappointed. From the opening bars of Falling in love With Love I felt the disappointment of having the plug pulled on tonight's Seth McFarlane gig at Ronnie's quickly ebb away. This girl is the biz! The doyen of north east piano players had been away from the scene for too long. This rare public performance by Alan Glen was one of those ‘I was there’ occasions. Glen is a man of few words – ‘One, two, three…’ is about as much as he has to say. His jazz piano playing does the talking, then some! Regular bassist John Pope forged a new partnership with drummer Paul Wight and one wondered how things would work out. Just grand I’d say! 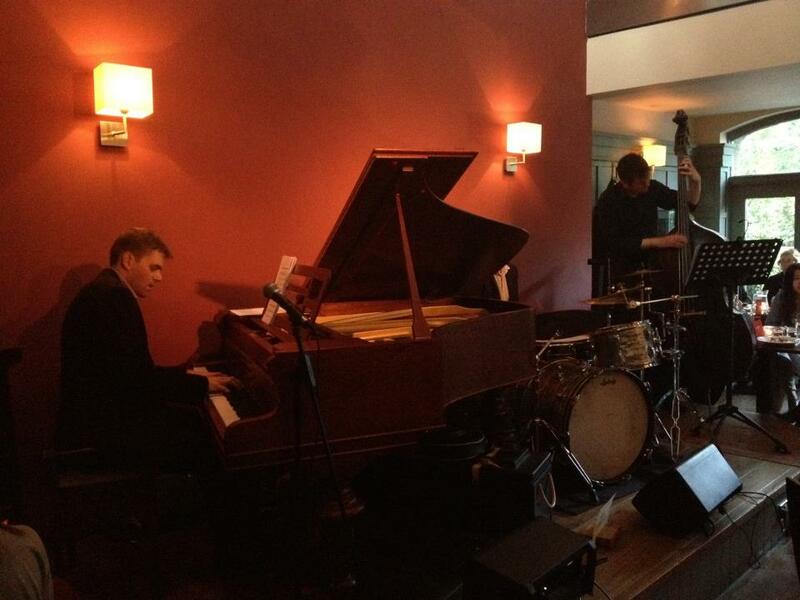 The set list is always five star material and a treat of modern jazz piano playing was in store. 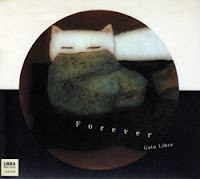 Love For Sale, Stella by Starlight, Autumn Leaves familiar tunes all, yet the sprightly tempi produced something extra special confirming that Glen has lost nothing in terms of ideas and their rapid execution. The trio opened up with a couple of numbers before Maddy Whitney stepped up to the mic. It was a hesitant start and the verse to Someone To Watch Over Me fluctuated pitchwise. However, as her set progressed the confidence grew and by the final You Go To My Head she had it nailed. Emillia Martenson occupied the headline spot, and a strong program of contemporary '60s/'70s songs followed, done in a jazz related format. The voice is powerful, the delivery is confident and the stage presence commanding. Katherine Stone Quartet @ The Cherrytree Restaurant: August 27 - Take 2. Katherine Stone (vcls), Dean Stockdale (p), Steve Doyle (dMs), Stuart Davies (b). We arrived at the Club Cherrytree about 8pm and the place was buzzing. Every table was full and there were plenty of people upstairs as well. The band were well into their stride and Katherine Stone was in full flow singing Wade in the Water, looking every inch a stunning night club jazz singer with, according to my fashion stylist companion, a perfectly updated '40s dress with frills and pleats, sparkling earrings and un tres chic chignon (or hair bun, to you and me). Much of the interval was spent discussing how to create that effect with your hair and I fully intend trying it. A New Century appearance is rather like waiting for a bus… nothing for ages, then three come along at once! On Saturday 1st September, we have the honour of opening Darlington New Orleans Jazz Club's new venue, the Studio at the Dolphin Centre, right in the centre of town after many successful years at the Arts Centre's Garden Bar. The full address is the Dolphin Centre, Horse Market, Darlington DL1 5RP, and there is a lift to the Studio on the first floor which also has adjacent food and bar facilities. Pay & display parking is available to the side and rear of the Town Hall. The show starts at 12.30pm, and tickets (£8.50) are available in advance from the Dolphin Centre on 01325 388406 or on the door. Please come along and give the club a good start in its new home. Click here for the latest from Laurie Pepper. Scott Hamilton (ten); John Pearce (pno); Dave Green (bs); Steve Brown (dms); + Allison Neale (alt). There's an ambiance about Pizza that comes across as your friendly neighbourhood jazz club rather than a nationwide chain. Tonight's session by Scott Hamilton, the last of four nights, was truly delightful. The tenor man is, these days, much more Lestorian than I remembered him - albeit via Brew Moore - and his opening number, End of a Beautiful Friendship was in fact a contradicition as I'm sure that for many in the audience it was the start of a beautiful friendship! He floated through What Is This Thing Called Love, I Want To Be Happy and Groovin' High to mention but some. Effortlessly and effectively, aided and abetted, by fine solos from Pearce on piano and Dave Green who is surely the most melodic of all our mainstream bassists. With Steve Brown - is there anyone happier at is work than he? - on drums kicking it along this was a great opening set and there was more to come. A brief chat with Dave Green re JNE's Margaret Barnes (he sends his love Margaret) then it was more swinging tenor before a surprise guest. Allison Neale. Alison is a lovely young alto player very much in the Art Pepper mode - I kid you not! Just goes to show there is hope for the younger generation yet! Allison, playing what looked like a vintage Conn Under-slung alto (tasty! ), and Scott blew Melancholy Baby and an extended jam on Rhythm changes. Allison knows the language of Bebop ok - it's almost as if she was born on 52nd St.! The set finished with Scott and Pearce playing an emotive Tenderly. Had my oldest son Phil here for a few days and introduced him to the Cherry Tree and Dinner Jazz. He was very impressed, not having come across this style of music night. Phil works in the hotel trade and travels the country staying and dining in good hotels. He gave the Cherry Tree 5 stars. Unbelievable quality and value for money with the Summer Special, now including a free glass of wine. My son he said he would return for another meal and that there would not be many places in the country doing around 60 covers on a Monday night. Not of direct interest to this blog but, as we do have one or two "Folkies" aboard, thought I'd mention it. Please note: Eliza Carthy Band plus support, due to take place at The Sage Gateshead in Hall Two on Saturday 13th October 2012 at 8pm has been CANCELLED. American tenor player Scott Hamilton is at Pizza Express in Soho tonight (and tomorrow - watch this space) and it was good to see it mentioned in the i newspaper - the concise version of The Independent. I quote..."...and his mellifluous tenor sax swings into town on a return summer visit to Pizza Express, reuniting with some old friends, including, John Pearce on piano and drummer Dave Green." Surely a typo as we all know Dave Green is a bass player. However, perhaps Dave read my Jazz Café post - where I noted Paul Grainger moving from bass to drums during yesterday's session - and decided not to be outdone! Alternatively, it could just be slip-shod reporting which poses the question, if they can't cut it on an item such as this what chance do they have on a major story? Maybe it wasn't Prince Harry but Prince Phillip! PS: it's my belief that Dave is on bass and Steve Brown on drums. Pete Gilligan (pno); Paul Grainger (bs/dms); Ray Truscott (bs); Claire Kelly (vcl). Well, Pete didn't unveil his vibes and Adolph didn't turn up either (unless that was him behind the bar) but, nevertheless, Messrs Gilligan and Grainger delivered the goods - did they not! 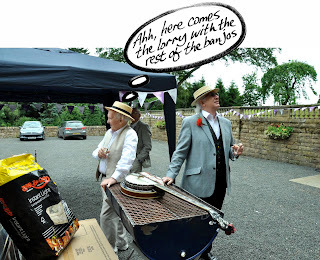 I've never quite understood why the local jazz Mafia boycott the Café - Keith Crombie has provided a showcase for local jazzers to ply their wares and get much valued experience - Dave Weisser does a similar thing at The Chilli and the Godfathers show small support for that either. Politics aside, Gilligan was in love - He Met Miss Jones, then there was Stella (by starlight), Alice (in Wonderland), Autumn (in New York) who he later Leaves. Claire Kelly showed and, after a hesitant I've Grown Accustomed to His Face, rocked I Got Rhythm. Who could ask for anything more? Well we did and got Love Me or Leave Me. A question like that is a no-brainer! The room had filled nicely by this time and Claire stepped down to allow the boys - Grainger was now on drums and Ray Truscott was threatening bass guitar - nobody threatens better! Billie's Bounce, You Don't Know What Love is kept the pot boiling before Claire stepped back up. Clare Fischer's Morning, despite being a first public airing was okay, Mr Ugly - tried and tested Kelly but No More Clichés was a new one and it worked. The Jazz Café (Pink Lane, Newcastle) is one of the cities treasures - don't let anyone tell you otherwise. 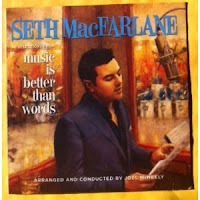 CD Review: Seth MacFarlane - Music is Better Than Words. 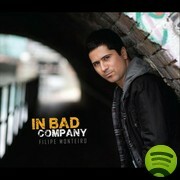 - RELEASED TOMORROW! Move over Bublé and the other keepers of the Gasbook flame - there's a new kid on the block. Well, not exactly a new kid as Seth MacFarlane is described in the blurb as "Multi Emmy winning Family Guy creator." Furthermore, the creative force behind Family Guy, American Dad! and The Cleveland Show, a franchise with an estimated worth of $2 billion, who has garnered four Emmys and seven nominations and is also an actor and film director goes for the full set by releasing his début vocal album on Decca. This raises the question, would Decca have put their corporate weight behind a guy working - say Forest Hall Club - as opposed to a guy with a lot of bucks behind him? I wonder if you could help me. My son-in-law is a direct descendant of Antonio Volpe and I read your comments re: 'Peter Fielding' with great interest. I would dearly like to purchase any recording of Peter & his band but I don't know where to start. Any internet searches have proved unsccessful. Can you help? 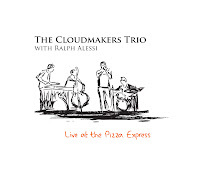 CD Review: The Cloudmakers Trio with Ralph Alessi - *Live at the Pizza Express. Ralph Alessi (tpt); Jim Hart (vbs); Michael Janisch (bs); Dave Smith (dms). I've several times proffered the opinion that Jim Hart is the number one vibes player - not just in the UK, but anywhere - and this CD only serves to enhance that belief. His flowing solos, unison lines and counterpoint passages with trumpet give an indication as to why he was one of the small number of Brits nominated in this years Down Beat Poll - he got my vote let's hope he got yours. This was a thoroughly entertaining, enjoyable and educational gig. I say educational because Barnhart gave us lots of information about the rag-time aspects of jazz, and interesting stories about such characters as Fats Waller. When the rest of the musicians later took to the stage, I realised that there wasn’t a sheet of written music to be seen. You really need to know your instrument and your jazz to perform in this way, so well done everyone! Dennis Rollins' Velocity Trio, heard recently at the Sage Gateshead, can be heard in concert from Wavendon (the Dankworth's country seat) on Jazz Line-Up tomorrow night ((Sunday 26). On Monday night stay tuned to Radio 3 to hear Julian Siegel on Jazz on 3. 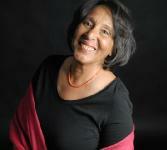 Siegel will be at the Sage with the Voice of the North Jazz Orchestra two weeks tomorrow (Sunday 9 September). The Sage’s Friday evenings have drawn large numbers to The Concourse. The keen jazz fan and the casual diner have for the most part happily co-existed in an informal, relaxed setting looking out across the Tyne to Newcastle. Bring your picnic chairs and a picnic - Gibside is also a great location to spot Red Kites circling above the woodland. Specialises in local foods and crafts, including Wallington meats and their own delicious homemade fudge. Lickety Split @ Hoochie Coochie Thursday August 23. Eddie Bellis (tmb); Kevin Eland (tpt); Alan Marshall (alt); John Hudson (ten); Bill Brittain (pno); Roy Willis (gtr); Mick Danby (bs); Paul Wight (dms); Steph and Ike (dancers). A slick, polished performance by a band that produces an overall sound suggestive of an even larger ensemble. Now this is what I call a classic! 19 tracks by one of the most versatile (insert your own genre) performers both as a singer and a pianist as well as a civil rights activist. 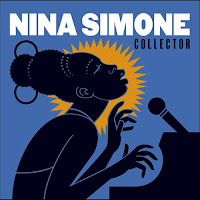 My Baby Just Cares For Me - what pianist hasn't tried to emulate Simone's intro and solo? Big band backing for a Stomping at the Savoy that draws comparison with Ella's version and loses nothing by it. You've Been Gone Too Long has some scintillating, unidentified but vaguely familiar, trumpet work. The voice digs deep into pain and sorrow on Gin House Blues, Wild is the Wind, I'll Look Around, and Blue Prelude. Louis Durra (pno); Ryan McGillicuddy or Larry Steen (2 tracks) Bs); Jerry Kalaf (dms). 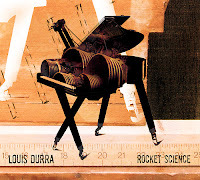 Unlike most piano trio CDs reviewed recently Durra doesn't indulge in angular flights of fancy preferring instead to plough a broad linear path through some fertile sixties pop songs. Durra had been on the California jazz scene for some 30 years before his career took a sudden upwards turn. A residency in a Los Angeles bar-restaurant allowed him to develop his own take on the traditional trio format incorporating songs by Bob Dylan, Bob Marley and Radiohead alongside original compositions as well as, of course, the Gasbook. Saturday 1st September sees the first gig at our new venue in The Dolphin Centre, which is situated centrally in Darlington's Market Square. The facilities provided in the Dolphin Centre are excellent. Good car parking is available nearby and, being centrally situated, all bus services are within easy walking distance. A Bistro Bar is available for all your refreshment needs. Picked up this item re jazz and politics in the States. Perhaps the Arts Council should read it. ...ALICE FLECK. Hope to see you Thursday Alice where you will receive your prize which is - Free Admission Plus a Pint of Real Ale or a large Glass of Wine at The Vieux Carré Jazzmen's Summer Barbecue at The Millstone, Haddricks Mill Road, South Gosforth (7.00pm). Just a reminder that the great ragtime and stride piano man from Mystic, Connecticut, Jeff Barnhart, will be in town this weekend. On Friday night he can be heard at the grand piano in the Customs House, South Shields (main theatre) from 8.00pm, solo in the first half and with local assistance (trumpet, clarinet/sax and drums) in the second - Box Office is 0191 454 1234. On Saturday Jeff is at the Trinity Centre, Gosforth, with a rather different programme - first half with his flautist wife, Anne, in a set taking us from Ragtime to Broadway (with rest-stops at Dixieland and Swing, Jeff informs us), second half in a solo exploration of some of Fats Waller's lesser-known compositions (some even unpublished/unrecorded) ..... "Unsaturated Fats", as you might say. Box office for this one is 0191 285 6130. Note 7:30pm start for Trinity concert. Davide Mantovani (bs); Ivan Hussey (cello); Paul Booth (sax/fl); Zoe Rahman (pno); Roger Beaujolais (vbs); Guillermo Hill (gtr); Davide Giannini (dms) various Latin percussionists. 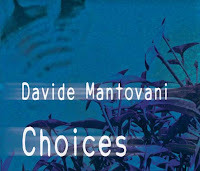 Choices is a CD as diversified as its title indicates. Fact is, this is as much World Music as Jazz which doesn't make it any less appealing for those with "ears". 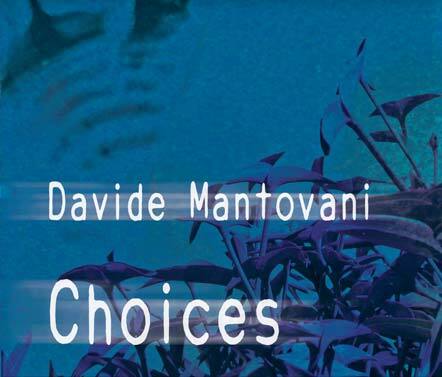 Italian born bassist Davide Mantovani moved to the UK in 1991 and quickly established himself as an A-Lister after working with such artists as Zoe Rahman, Andy Sheppard, Jean Toussaint, Jim Mullen and Alex Wilson - the actual list is longer, much longer. You’ll be wondering why on earth Lance is letting me review this recently issued CD on a jazz blog, so I will quote from the CD insert: The art of dividing upon a ground bass or playing divisions was the Elizabethan and seventeenth century equivalent of our modern jazz tradition. In other words, this is what all you jazz instrumentalists would have been playing if you’d lived about four hundred years ago. The ground was a repeated chord progression over which the musicians improvised (divisions); or sometimes they would play variations on a popular tune of the day. Sounds familiar, doesn’t it? Dean Stockdale Trio @ The Cherry Tree Restaurant, Jesmond. Dean Stockdale (pno); Neil Harland (bs); Keith Hill (dms). (Review by Lance - photo courtesy of Viv Williamson). A fairly routine day at the office type gig with a few sound hiccups re the mic and the overall balance. Nevertheless, God Bless The Child (who's got his own - mic?) got things rolling with Stockdale digging deep into his blues flavoured bag of musical tricks. Meanwhile, I was digging deep into the Chef's bag of culinary delights in the form of King Prawn & Scallop with Garlic, Chilli and Coriander, with Spiced Focaccia. A rare visit from an American jazzman in 1953. Look at those ticket prices! 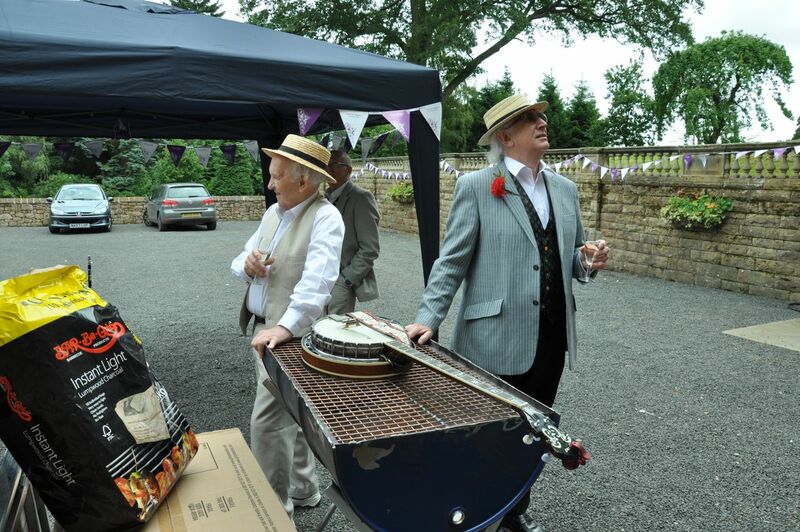 What is trumpeter, Fred Rowe (light waistcoat) thinking? ENTRIES NOW CLOSED! THE JUDGES ARE OUT! 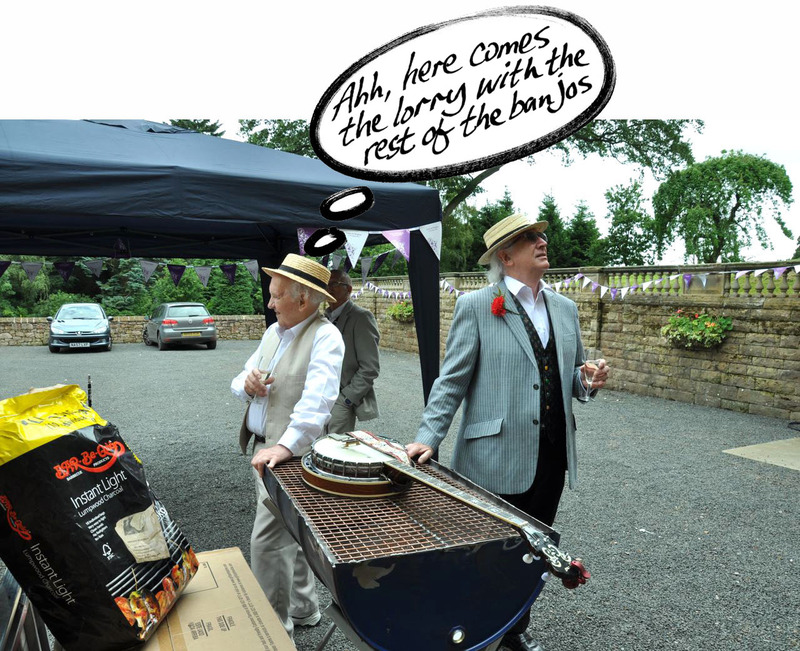 The winner gets Free Admission Plus a Pint of Real Ale or a large Glass of Wine if they come along to The Vieux Carré Jazzmen's Summer Barbecue at The Millstone, Haddricks Mill Road, South Gosforth on Thursday evening (August 23) at 7.00pm. 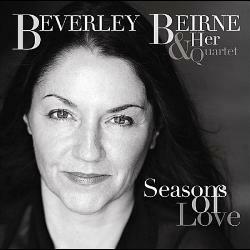 CD Review: Beverley Beirne and her Quartet - Seasons of Love. Beverley Beirne (vcl); Mike Cox (ten); Graham Hearn (pno); Ian Mann or Adrian Knowles (bs); Ronnie Bottomley (dms). Beverley Beirne is the latest aspiring jazz diva to roll off the seemingly endless conveyor belt onto an already over-crowded stage. Where are all these girls going to find venues to hawk their wares? You're Looking At Me - a spritely, albeit self-deprecating, lyric from Bobby Troup - also works well. In fact, one of the album's strengths lies in the choice of material which avoids the hackneyed. 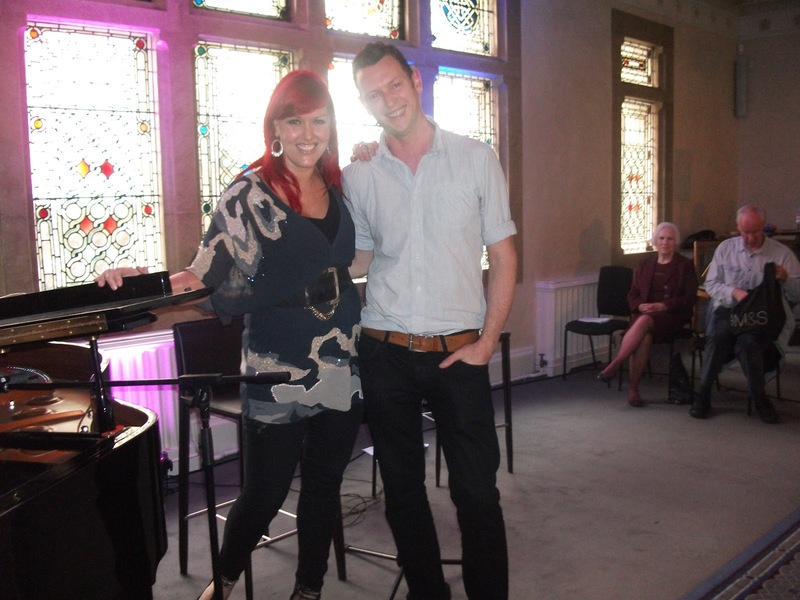 Welcome aboard Beverley - we'll just have to get a bigger stage! God knows what we'll do if the guys rush into jazz singing as enthusiastically as you gals! When Lindsay sings Why Try to Change me Now? I'm lost - her slave forever! The rest of her program could consist of Baa Baa Black Sheep sung backwards in Russian in 7/4 time and I wouldn't care! This was a defining moment and it was also her opening number. Why Try to Change me Now? - a Cy Coleman tune with a triple rhyme lyric by Joe McCarthy - is one of the songs that brought Frank back into the public eye and, whilst I'm not making comparisons, Lindsay's version offers a great alternative take with its up tempo chorus and relaxed middle eight. Follow the link for details of tonight's program on BBC 4. Sarah Ellen Hughes, Emma Smith, Kwabena Adjepong, Shaka Phillip (vcls); George Moore (pno); Tim Thornton (bs); Andy Chapman (dms). What a delight! 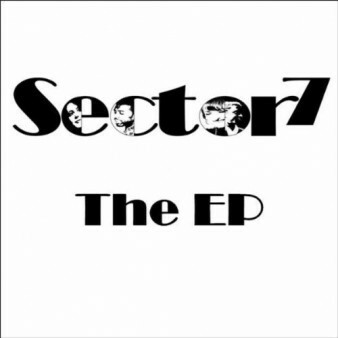 Vocal groups of this calibre are few and far between and, in this country, Sector 7 are probably unique. The brainchild of Sarah Ellen Hughes, who arranged 4 of the 5 pieces, Sector 7 came together to act as a backing group for Ms Hughes who candidly admits she'd got together a group of singers who were better than her! I wouldn't necessarily go along with that modest assessment but certainly all four are of comparable standard and, most importantly, compatible. Mo Scott (vcl); Gary Dunn (bs); Neil Harland (bs); Paul Smith (dms). There was a whole lot of shakin' going on both on stage and behind the bar. Hoochie was packed with a crowd drawn by the charismatic blues belter, whose voice is inversely proportionate to her diminutive frame, and the Thursday night 2 for 1 cocktail offer. This latter attraction was a double edged sword inasmuch as it meant us non-cocktail drinkers waited a little longer as these mysterious multi-coloured potions were shaken or stirred according to preference. The death has been announced of Bill Tillman, sax player/singer and former member of Blood, Sweat and Tears. Tillman, aged 65, died after a bathtub fall at his home in Houston, Texas, where he'd spent the last 30 years of his playing life after BST. He died on Wednesday August 15. Dominic J. Marshall (pno); Tobias Nijboer (bs); Kaspars Kurdeko (dms). 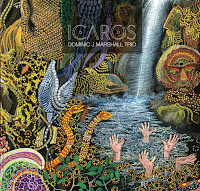 Why?, I ask myself, haven't I heard, or even heard of, Dominic J. Marshall before now. 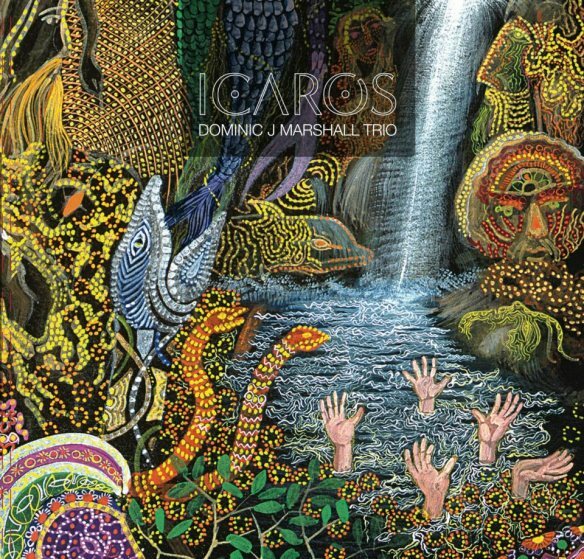 A product of that mega musical maelstrom that is Leeds College of Music, where he arrived via the Alan Hawkshaw Scholarship route, Marshall went on to win the prestigious LCM Piano Prize. From Leeds he re-located to Amsterdam which probably explains why he slipped off my radar. The loss is mine. CD Review: The Fred Hersch Trio - Alive at the Village Vanguard. Fred Hersch (piano), John Hebert (bass) and Eric McPherson (dm). A Two Disc album recorded “live” at the Village Vanguard in February 2012 by Hersch's current Trio. 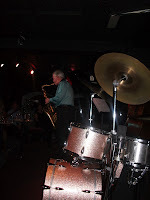 Hersch, a gifted musician, who’s already achieved much in a career that includes working with Stan Getz, Lee Konitz, Art Farmer, Joe Henderson, and Norma Winstone among others, currently divides his time between teaching, writing, touring, recitals and raising awareness in the jazz community of the fight against HIV/AIDS. Prague looks to be an interesting place for the jazzman as the following article indicates. 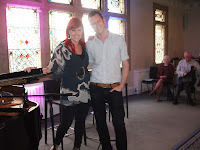 To highlight the extraordinary jazz talent in the Czech Republic, Steph Sheehan from lowcostholidays.com asked UK jazz bloggers to contribute questions towards an interview with Tony Emmerson, the oracle of jazz in Prague. Tony moved from London to Prague six years ago and now writes a wonderful blog, dedicated to Prague Jazz. Here he talks about his top 5 Czech jazz artists, how easy it is to make a living as a jazz artist in Prague and why this city has one of the best jazz scenes in Europe. There was Marian Page (McPartland), George Shearing, Ralph Sharon, Dill Jones and Derek Smith. All British pianists who emigrated to The States. We know about the first four but what is Derek Smith doing these days? Jon-Erik Kelso has posted a Kenny Davern video with Derek on piano which has prompted the question. I guess he's 81 now. Von Freeman died on Saturday August 11 - he was 88. It might be said that Freeman was the player everybody had heard of but, outside of Chicago, had never heard! Listen to this example of his minimalist approach to Bewitched, Bothered and Bewildered. “They said I played out of tune, played a lot of wrong notes, a lot of weird ideas,” Freeman told the Tribune, in 1992. “But it didn't matter, because I didn't have to worry about the money – I wasn't making [hardly] any. I didn't have to worry about fame – I didn't have any. There was I, enjoying folk fiddle music in Elvet Methodist church in Durham City, when the two above-mentioned took the stage and wowed an audience of about a hundred folkies. You see, it happens that Tim Kliphuis had been working as a tutor with the young people who’d been attending the folk workshops during the previous week, so he’d been asked to play in the final concert, and James Birkett came along to do his bit on guitar. Tim, a wonderfully skilled exponent of the Stephane Grapelli style of jazz, pleased us mightily with his swirls, whirls, pizzicato tunes, and flute-like effects. This Can’t be Love came first to get us into the mood, followed by a tender version of A Nightingale Sang In Berkeley Square. My Love is Like a Red, Red Rose was played in the Latin style and renamed Red Rose Calypso, with Jim (and us) enjoying his solos, and the set ended with After You’ve Gone, and a Duke Ellington piece. Well done lads. Paul Scott (gtr/vcl); Ray Truscott (bs); Martin (from Poland) (dms). Newcastle's Jazz Café is totally unique - What you see is what you get. That can vary from all to nothing and while, for a moment, the latter seemed to prevail it did finally erupt into life. 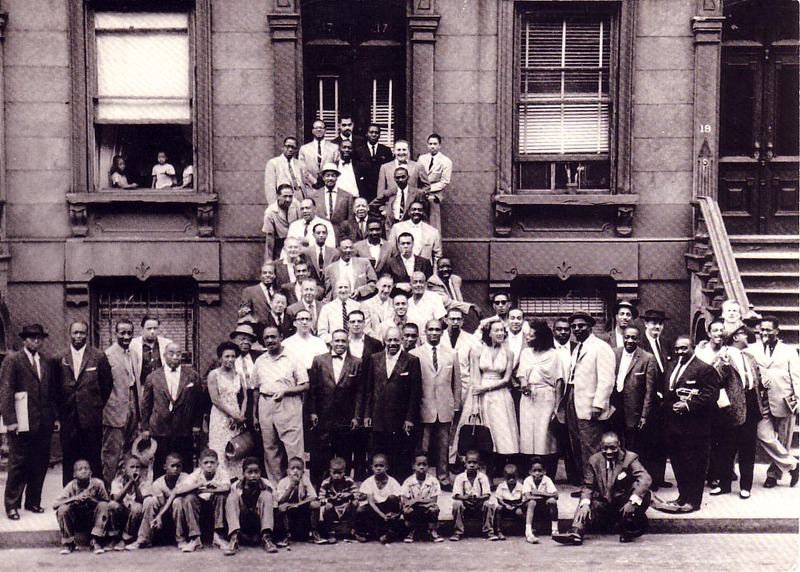 54 years ago today the most famous photo in jazz history was shot in Harlem. Marian McPartland was part of that picture - the only British born woman present. Follow this link to read about Marian and the filmed documentary that has just been completed. Michael Feinberg (bs); Billy Hart (dms); George Garzone (saxes); Tim Hagans (tpt); Leo Genovese (keys); Alex Wintz (gtr). 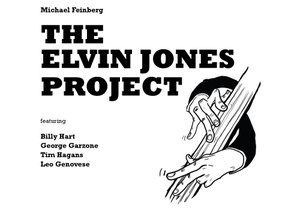 The Elvin Jones Project, not surprisingly, is a tribute to the late Elvin Jones by bassist/composer Michael Feinberg who concentrates on the musical relationships Jones formed with various bass players. Given that Jones operated very close to the outside this disc hovers in the hinterlands between madness and sanity. I'm pleased to say the latter, more or less, prevails. Belinda Voshtina (vcl); Sam Kelly (ten/clt); James Harrison (pno/Hammond); Ian Simpson (gtr); James Robson (bs); Joe Booth (dms). The Lemon Tops who, paradoxically, didn't wear lemon tops (a take on the Yellow Jackets I guess) are students from the BMus Course and fine examples they are too. Tickets are now on sale for this years Lockerbie Jazz Festival. The 2 day event is held on the weekend of Saturday Sept. 29/Sunday Sept.30. As in previous years the event takes in different styles and venues and no concert ticket costs more than £10. For full details go to http://lockerbiejazz.com/. NYJO with special guests inc. Kenny Wheeler, Nikki Iles and Tim Garland perform an Ellington programme at the Royal Albert Hall tonight. Catch the concert live on Radio 3 at 10:15 pm and on BBC 4 next Friday (August 17). Our man in Hong Kong became, briefly, Our man in Singapore when he played a gig at the Olde Cuban. It sounds like the Singapore version of Boisdale down at Canary Wharf with it's abundance of whisky and cigars. Colin kindly sent us some photos of the gig. Katherine Stone (vcl); Dean Stockdale (pno); Mick Danby (bs/backing vcl); Steve Doyle (dms). Besame Mucho suggested the Coconut Grove or the Stork Club back in the 1940s. A gentle rumba rhythm (or was it a beguine?) set the mood for the evening.Cheek to Cheek took us into safe songbook territory, impeccably sung and played with pianist Stockdale providing the jazz. The above page has now got 116 quotes ranging from Pepper Adams to Michael Zwerin and is multiplying faster than New York did nine months after the famous power cut! Nevertheless, if you'd like to see your favourite jazz (ish) quotes added please send them via comment or email. Just one proviso, try and avoid the hackneyed - Condon on Bix, Zappa , Zoot, Miles on Coltrane, etc. - and, to avoid libel, please quote source! One of the most prolific of modern day composers, Marvin Hamlisch, has died aged 68. Hamlisch wrote for both Broadway and Hollywood achieving many Oscar nominations and winning 3 of them along with a Tony and a Pulitzer. Marvin Hamlisch died on August 6 after a short illness. Hey! 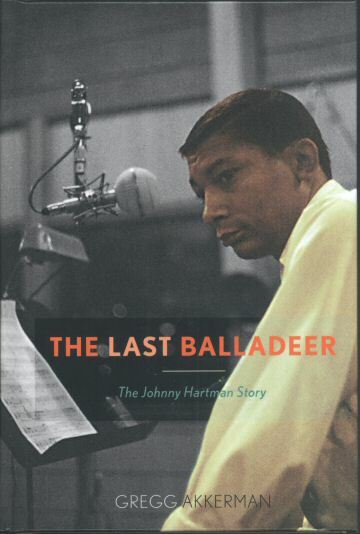 This book looks good - The Last Balladeer: The Johnny Hartman Story by Gregg Akkerman. Hartman was an amazing singer yet not as well known as he should have been. His voice had a rich timbre with a fullness that exceeded that of even Billy Eckstine and Nat King Cole his nearest contemporaries. Check "The Last Balladeer" out here. Another good (ish) day for our cyclists at the Velodrome. Sir Chris Hoy powered home in the Kieron like as if it was the last 32 of a Ryan Quigley solo. Young Laura Trott took the Omnium - the comparison was Carol Kidd making her mark at the Edinburgh Jazz Festival back in the 1980's. But Victoria Pendleton! she was rail-roaded. Elbowed by the Aussie, whom she beat, only to be disqualified, it was little wonder that she showed little fight in the next match. Her second DQ of the games, and the feeling was that this was Billie Holiday on wheels getting on the wrong side of those officials sulking at Britain's success in what were, once, their events. Natsuki Tamura (tpt); Satoko Fujii (acc); Kazuhiko Tsumura (gtr); Norikatsu Koreyasu (bs). I can count on one finger the number of Japanese jazz CDs I've listened to over the years then, lo and behold, two come at once. Dinner & Cabaret & Dancing! Come to The Gosforth Park Marriott Hotel and treat yourself to the full VIP experience. This exclusive event includes a delicious three-course meal, entertainment from the fabulous Jason Isaacs, followed by a late bar and dancing till the early hours – what could be better? Dinner and show is £30 pp (arrive at 7.30pm for 8pm). Chats Bar is open from 6.30pm if you want to enjoy a pre-show cocktail or two and get into the party mood. Book with Emma at the hotel on 0191 236 1615 - there is also a special room rate for those wishing to make a night of it! For those of you not wishing to eat, there are a limited number of 'show-only' tickets at £15 pp. You will be able to take your seats from 9pm, but can enjoy a drink at the bar if you arrive earlier. 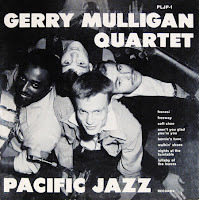 Those of us who remember with affection the Gerry Mulligan Quartet know all about Gerry, Chet and Chico but what happened to Bob (The Bass) Whitlock? MarkJazzWax has tracked him down for this, part one of an interesting interview. Mark's site is one of the best for Stateside articles, interviews and information and always worth a visit - like BSH it is updated daily. Jazz in the Afternoon @ Cullercoats Crescent club. Yesterday’s torrential rains flooded the bar and cellar at Cullercoats Crescent Club. 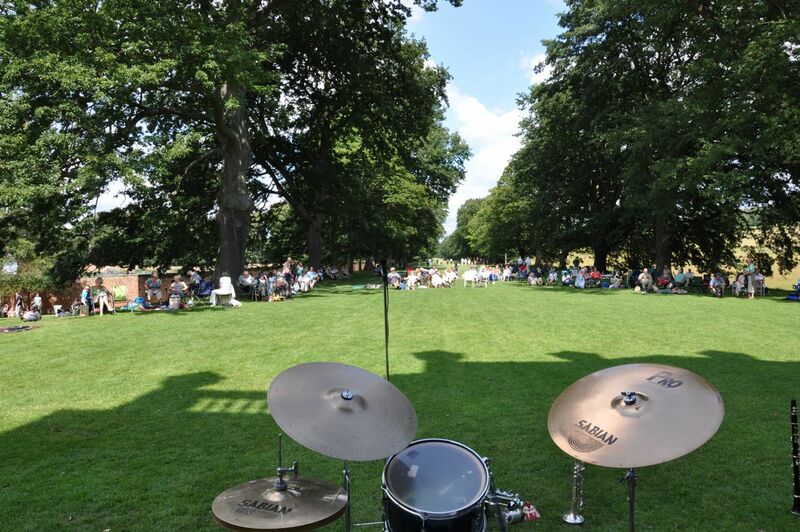 The regular Monday afternoon jazz session went ahead thanks to the club’s determined efforts to keep the show on the road. 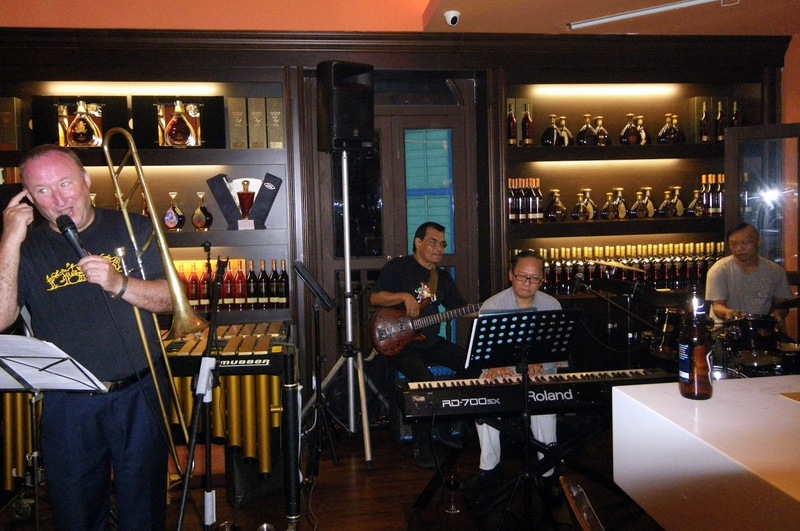 The band relocated to the recently refurbished lounge and started on time. The beer selection has improved along with the refurbishment. A pint of the Jarrow Brewery’s Rivet Catcher in hand, perched on a high bar stool at the back of the room afforded views of the band and through the windows the panoramic vista of Cullercoats Bay and out over the North Sea. 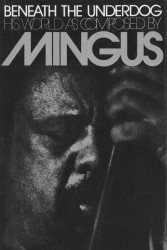 I have just finished reading Charles Mingus “Beneath the Underdog” and thought that it was a brilliant insight into the mind of a brilliant man. What does anybody else think ? I would be interested to hear opinions/criticisms etc. Participants had toiled long and hard for this once in a lifetime opportunity and gold medal performances were sure to be cheered to the echo. Yes, the Jazz Olympics had returned to the Georgian Theatre in Stockton on Tees. Security was tight. Entering the Green Dragon courtyard an exit-entry technician (bouncer).searched suspicious looking jazz fans (aren’t they all?). Those found to be in possession of alcohol and other performance-enhancing substances were fast-tracked into the venue. Tables were set out in decadent cabaret style in the dimly lit former Wesleyan chapel. The best seats were bagged and finely- tuned fans were determined to see out the marathon all-dayer. Electrolytes or not the beers were on the table…gold medal performances were assured. 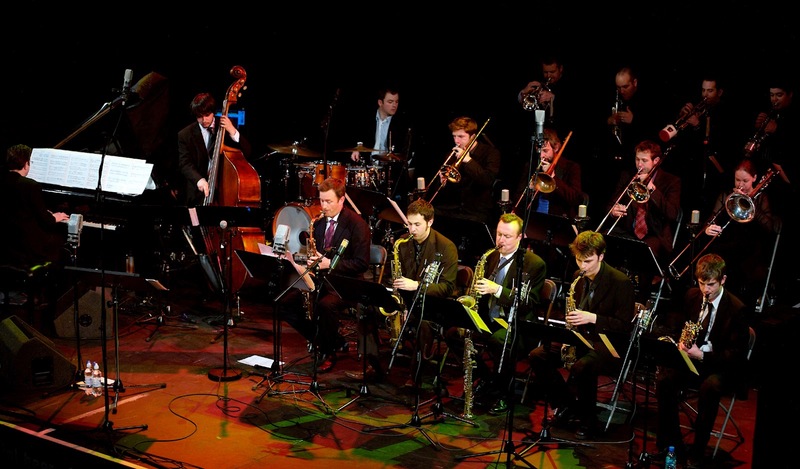 Jazz history will be revisited with passion, vigour and fidelity as the Scottish National Jazz Orchestra follows its recent successes in the Parliamentary and Scottish Jazz Awards with a celebration of the artistry of Duke Ellington, which tours Scotland in October. Brian Chester (tmb); Roly Veitch (bjo); Phil Rutherford (sousa); Mike Durham (tpt/vcl); Derek Fleck (clt). Bourbon Street Parade got us cruising down the river and what a lovely cruise it was - despite the lack of real ale! We were passing St. Peter's Basin Marina - that yuppie haven. The yachts may not have been exactly Monte Carlo but they had the edge on Hebburn Marina, a few miles down river and when the band blew When My Dreamboat Comes Home, it, somehow, seemed appropriate. And they were straight in, no messing around, with Ruth singing Nice Work if you can Get It, and the band certainly did more than nice work, with skilled arrangements, interesting solos and trading of fours. The sound was what I think of as ‘New York’, especially from the horns, but that may be just to my ears. The next Southbridge Evening will be held on Monday, the 6th of August 2012 at 9pm. This session will feature the versatile Mario Serio on piano, Eddie Jensen on bass and Tan Boon Gee on drums. Also, as a special treat to everyone, we will have a special guest from Hong Kong, Colin Aitchison of Ned Kelly's Last Stand. Colin has performed at Jazz@Southbridge many times before to packed audiences. He jokes, plays the trombone and sings. So please join us as Colin is a wonderful entertainer. Cover Charge: $20 with 1 free standard drink. As direct access to level 4 of the club is prohibited, kindly proceed to level 2 first and request for access to level 4 from the staff. These are the boys Colin will be performing with - http://www.youtube.com/watch?v=DBX4Mc4SFXo&feature=youtu.be - somewhat different to the Real Ale Jazz Train! 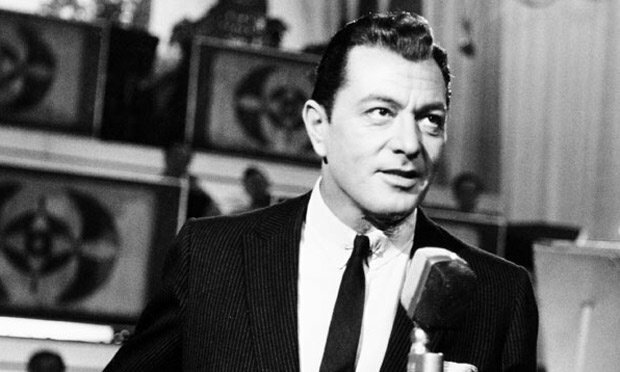 RIP Tony Martin.one of Hollywood's finest musical stars. OK so Tony Martin wasn't a jazzman. He was a singer though and an actor with an engaging presence. He had a way with a ballad that made it easy to understand why such a Hollywood lovely as Cyd Charisse would stay married to him for 60 years! Favourite Tony Martin record? Tenement Symphony was great but, for me, it was the duet with Fran Warren - Take A Letter Miss Smith. I wonder how many of our readers remember that one? You made some wonderful musicals Tony - we love you. Died July 27 aged 98. Pete Gilligan (pno); Mark Williams (gtr); Paul Grainger (bs); Ian Forbes (dms). + Dave Parker (bs); Lindsay Hannon (vcl); Richard (tpt). This was, perhaps, the best Hoochie Jam yet! Gilligan, looking as though he'd just auditioned for the part of Sky Masterson (Guys and Dolls), met Miss Jones like she'd never been met before. Have You Met Miss Jones? Pete's met her! He and Mark soared through the changes and Miss Jones didn't mind at all. One of the crazier features of the North East in July is the Real Ale/Jazz Train which runs from Newcastle to Carlisle and back, powered by Diesel, Matfen Breweries' Real Ale and the Vieux Carré 4 or Fred Rowe's Railroad Stompers. Colin Aitchison, over here from Hong Kong, played on one of the journeys and part of the proceedings were posted on YouTube. Colin is on trumpet, Gavin Lee, clarinet, Brian Bennett, banjo and, I think, Phil Rutherford, sousaphone. A good time appeared to be had by all and I'm going to get me some of that Matfen Brewery Beer! Spirits Up Above is a timely release. 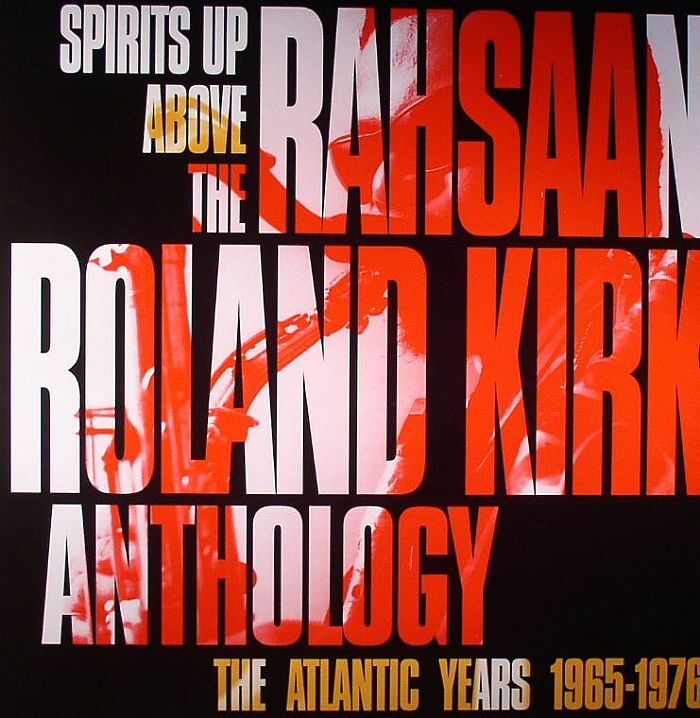 December 2012 marks the thirty fifth anniversary of the death of Rahsaan Roland Kirk. Rhino Records’ double CD surveys the Whistleman’s recorded output for the Atlantic record label over a thirteen year period up to the year before his untimely death. 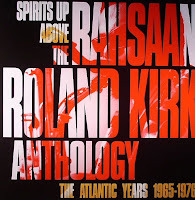 Studio cuts and in concert performances remind the listener of the constants in Kirk’s work; respect for the tradition (New Orleans to Ellington to Mingus to Coltrane), the church, the blues, swing, bop, excellent sidemen – especially the pianists. The David Newton Trio featuring Nigel Clarke and Paul Morgan - Sunday 19th August at 8 pm at The Royal Clifton Hotel, Southport. Another Gold Medal for Bradley Wiggins - he delivered victory in the Olympic Cycling Time Trial with the panache of, say, John Coltrane's Giant Steps. Bravo and chapeaux too to Chris Froome who, once again, played McCoy Tyner to Bradley's 'Trane. Chris picked up the Bronze.